Our economic arrangements require a persuasive story that can explain who is rich, who is poor, and why. This story shapes our attitudes toward what is just and unjust; this story dispenses power to some and withholds it from others; and the deeply political and paradoxical nature of this story presents a valuable site of rhetorical inquiry. Economic Injustice and the Rhetoric of the American Dream fills an important scholarly gap by connecting the need to make sense of economic arrangements with the rhetoric of the American Dream. 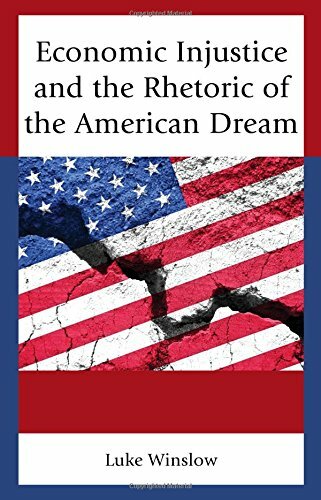 Luke Winslow examines how the rhetoric of the American Dream has emerged as a dominant cultural touchstone in oscillation with a widespread shift to individualistic explanations for economic arrangements, the arrival of neoliberalism, growing levels on inequality, and dismal rates of economic mobility. By developing the tools of rhetorical and ideological criticism this book explores the American Dream in relation to religious, economic, educational, and political institutions ranging from Prosperity Theology to the candidacy and election of Donald Trump. Recommended for scholars in Communication, Economics, Political Science, and Religious Studies.